Just what is Escalating Density Training? The premise of EDT is simple. Your goal for each work out is to escalate (increase) the density (workload) of your previous lifting session. In other words, you are lifting more total weight each work out. Lets say you did 40 reps in 15 minutes last session. Your next session goal is to complete at least 41 reps in 15 minutes with the same weight. You've just escalated your density. This how Escalating Density Training works- First you take a 15 minute block of time and select two exercises. Charles recommends two antagonistic muscle groups like back and chest in a block. This helps prevent fatigue and actually helps activate the nervous system more effectively - working antagonistic muscle like this is a VERY powerful training technique. In that 15 minute block of time, you attempt to perform as many reps of both of those exercises as possible, going back and forth between sets of each, e.g. 5 reps chest, then 5 reps back, then 5 reps chest, taking as much or as little rest time as you like. Here's the key...you're NOT training to failure. You're staying AWAY from failure so that you can PERFORM better and get more reps. When you stay short of failure, your body doesn't accumulate metabolic waste products as quickly and you'll be able to perform more reps for a longer period. You'll accomplish by training volume what other programs attempt to accomplish with training intensity. Bottom line, your muscles not only get trained with a good amount of volume, they also get trained for more power, which makes you STRONGER much faster than with conventional training. It's a potent combination, which I can tell you from experience is VERY effective. As I mentioned above, Escalating Density Training utilizes 15 minute blocks of time called PR Zones (PR stands for Personal Record - this is key so remember that!). The starting point when being EDT is to work with one PR Zone. This makes your workout exactly 15 minutes long. From a time standpoint, 15 minutes is a VERY reasonable amount of time. Even with performing one PR Zone per workout, you're going to get results. This only needs to be done 3 times a week to get results. So 15 minutes, 3 times a week...that is DEFINITELY practical, even for the busiest of people. The next level is to perform TWO PR Zones in a workout - this allows you to work 4 exercises in a session. This is the level I find I gravitate to. It gives me a nice balance of workload and doesn't result in too long of a workout. The final level is a THREE PR Zone session. This is useful if you're an advanced trainer and your recovery systems are highly tuned. I've tried a three PR Zone session but found that for me, the volume was too much all at once. I prefer to do the two PR Zone sessions but more frequently so I'm not knocking down my recovery system so much each time. That's the beauty of the EDT system. It can be used by absolutely ANYBODY, from the total beginner to the very advanced athlete, the EDT system adapts to whatever workload you're capable of. You're competing against YOURSELF, not some arbitrary standard. You're competing against what YOU did in your last session! For example, if you did 42 reps of the bench press last week (your PR), in order to improve and progress, you need to get more than 42 reps THIS week. You're competing against the standards you set yourself and by beating those standards, you AUTOMATICALLY progress. And if you're at all competitive you're going to fighting to beat those records on a weekly basis, too. But bottom line here, it really doesn't matter if you've never touched a weight in your life. You can do a 15 minute PR Zone and get 10 reps with just the bar on a bench press. As long as you get 11 reps next week, you're improving. If you're advanced, you're going to be selecting tougher exercises, using more weight and probably pushing yourself harder and faster. But the BASICS of the program remain the same...more reps within the time frame. It's just elegant in it's simplicity. This program is right now in use by men, women, young and old (I think 78 years is the oldest I know of). So don't think for a second you can't use this because you're over 60 or 70 or even 80. Or if you're a woman who doesn't want to "bulk up" (women don't have the hormonal apparatus to gain monster muscles - I always say I WISH I could gain muscle as fast as many women FEAR that they will). (2) Is the program well communicated? Absolutely. As you can see from my quick explanation above, the concept of doing more work within a specific time frame is really not that hard to grasp. This is the core of Escalating Density Training. Charles does a nice job of explaining how Escalating Density Training works in the Video Guide. The other great thing about the Video Guide is that you will also get to see two ACTUAL PR Zones, performed by a few of Charles' fellow trainers as he explains what's going on all the way through each one. These are actual Personal Records for both these guys (could be the pressure to perform on camera!) so you'll see EXACTLY what a full PR Zone looks like. Learning by reading is one thing. Learning by WATCHING is a step above. When you DO a PR ZONE, you'll know what you're doing every step of the way. In the Video Guide, Charles and Tim Larkin (one of the other trainers I was telling you about) go into great detail about how the mechanics of the program work...things you might right into, problems that could crop up, and, most importantly, HOW you can SOLVE each and every one of them. There is some excellent troubleshooting advice not only for EDT itself but for training in general. You can apply a lot of it to pretty much any program you're using. "The Complete Video Guide to Escalating Density Training" will have you up and running with EDT right after you finish watching it. (3) Do Staley's techniques work? Honestly, this is where Escalating Density Training really shines. Here it is right now in black and white...muscles don't have brains...they don't KNOW that the fancy program you're on is supposed to build muscle and strength. All your muscles know is that they are told to contract to move a resistance. They know that if the workload that they're subjected to is greater than what they have experienced before, they need to get larger and stronger to be prepared for it next time. And that's about all they know. 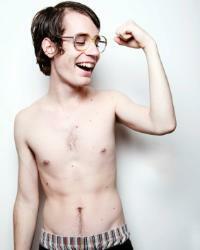 EDT reduces training to this very basic level, simplifying things for your muscles. One week you do 42 reps of bench press with 200 lbs. "Okay," think your muscles, "let's prepare for doing that again next week." But next week, you perform 50 reps with 200 lbs. "Okay," think your muscles, "let's rebuild so that we're bigger and stronger so we can handle 50 reps next week." And so on...every time you increase that workload, your muscles HAVE NO CHOICE but to adapt by getting bigger and stronger. You're pretty much giving your body NO CHOICE but to get results. Then when your muscles have adapted really well to that number of reps, you increase the weight and force to adapt AGAIN. I'll use the old suntan analogy here - the best way to get a tan is not to go out in the sun for 5 hours the first time. You go out for 15 minutes and build a base. Then you gradually increase your time in the sun to increase your "tanning workload". It's the same thing with EDT. But the key difference with Escalating Density Training is this...you don't ever "burn" yourself with EDT! The increase in workload is based completely on the size of the base you've built up, meaning you can only progress at the rate your body is capable of so you're not pushing TOO hard and actually setting yourself back! The main problem with many other training programs is that they have no system for increasing workload. With EDT, the whole PREMISE of the program is to systematically increase workload. As I keep saying, the design is just elegant in it's simplicity. The theory of it is scientifically valid and the results you'll get with the program bear that out. There is not much to dislike about Escalating Density Training. But here a couple things to think about. Your training variety may seem limited since you are only using two exercises per PR. And while it may be fun to mix things up, too much variety can limit results. By sticking to the program, your muscles will have to adapt to the consistent loads given and GROW. Since your PR is 15-20 minutes long, you will have to learn how to pace yourself. If you go nuts out in the first five minutes you'll be hurting for the next 10-15. 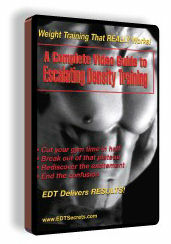 "The Complete Video Guide to Escalating Density Training" is an excellent product. EDT itself is an extremely useful training program that can be used by absolutely ANYBODY. The videos do a very nice job of explaining how EDT works and many ways you can adapt and fine-tune the program to maximize your results. This is a powerful, information-packed product and definitely worth the price, especially when you consider all the bonuses you're going to get with it. And, if you ARE interested in learning more about Escalating Density Training before purchasing it, they offer 5 sample videos taken directly from the Video Guide so you can see and hear the type of information you'll be getting. There is no obligation so sign up for free videos with the link below.